Wedding is still October 9th!!! 2 months after the baby is due!! 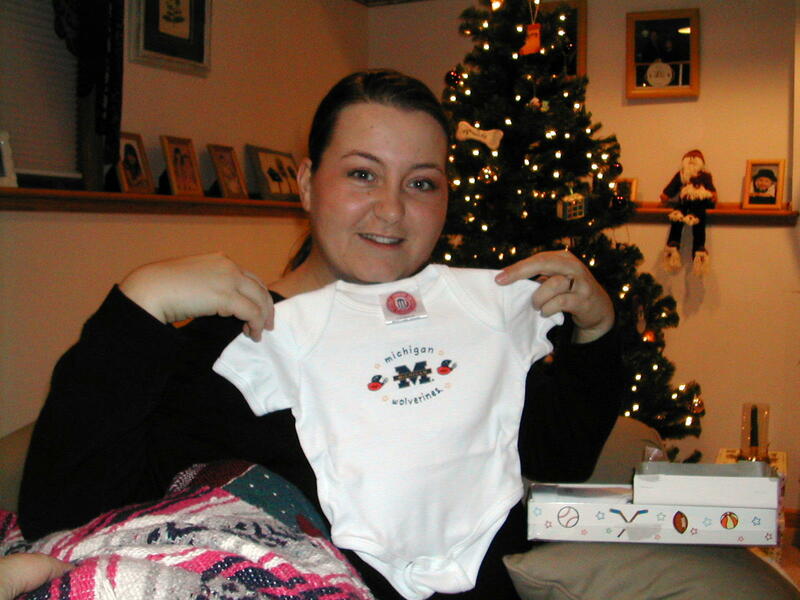 This ultrasound picture was taken on December 12th, 2003. I was having a ultrasound done of my ovaries as part of a medical workup related to my Polycystic Ovarian Syndrome. I had no idea that I was pregnant. While the ultrasound tech was performing the test, I could see her measuring the cysts on my ovaries. All of a sudden she came to a little black spot that she spent a lot of time measuring. While she was doing this, she was asking where I was from, where did I work, and finally, "How does maternity leave sound?". I asked, "Am I pregnant? ", and she said yes! It was one of the best surprises ever! Especially because, I never thought that I'd have a surprise pregnancy. Having been diagnosed with Polycystic Ovarian Syndrome (PCOS), the ability to get pregnant gets more difficult as you do not ovulate normally due to hormonal imbalances. So, what a surprise to me! And to her! So, it was a Friday afternoon, and this baby had taken us all by surprise. I got to meet with my Reproductive-Endocrinologist (who I had meet the first time about 5 days before) and he verified the pregnancy. But, he wanted me to have another ultrasound 10 days later, as I was only 5 + weeks pregnant at this time. So my next mission was, how was I going to tell Dennis? And how was I going to keep it a surprise, and not want to tell him the second I saw him? Well, thank god, I only had to wait an hour or two before he got home from work. So, I quickly ran and got a couple of greeting cards. One for him and one for my parents. The card for Dennis had a baby on the cover making a kissing face. On the inside it said " I was born to love you! ", well after 'born', I wrote (conceived). I continued to write from the baby's perspective about my age and when he'd see me. My parents card had "Baby's First Christmas" and a spot for a picture, which I thought would be a perfect spot for the ultrasound picture. I got the cards all ready and went and got Dennis from work. As soon as he gets in the car he's asking how my ultrasound went. I spoke briefly about the cysts that were found related to the Polycystic, and explained that they wanted to do another ultrasound 10 days later to recheck things. I quickly tried to change the subject and just desperately wanted to get home so I could share the news. Well, we finally made it home and there was his card sitting by the front door. He started opening the card..........as soon as he saw the baby on the front, he said, 'Are you pregnant? ', and I said, 'open the card', he asked again, ' are you pregnant? ', he opens the card and the immediate look of a deer in headlights came over his face! But I could tell immediately that he was just as happy as I was. We hugged and I cried and were immediately trying to figure out the due date and how close that was going to be to the wedding! We went out the eat to celebrate and got to tell my parents the news later on that night. They were so surprised and so happy. We decided to only tell a few close friends before the next ultrasound as the chances of miscarriage were pretty high at this point. So the lifestyle change came immediately and the learning was just beginning. The next day we went and bought a pregnancy book, being very careful that we wouldn't run into anyone we knew at the book store. At this point, I could hardly tell I was pregnant, just mostly tired at this point. No morning sickness yet, but I was taking every precaution to keep this baby safe.........no smoking, no drinking, NO COFFEE or caffeine and taking multivitamins.! I think the longest 10 days of our lives were from that first ultrasound to the next. The next ultrasound was December 22nd, just two days before Christmas Eve. We had decided to tell our families on Christmas Eve and Christmas Day after seeing the heart beat on the second ultrasound. Here is that picture. Here is the ultrasound picture of our visit when we got to see the heartbeating. The arrow is pointing to where we saw the heart moving. The top circle thing that looks like a head, isn't........it's actually the yok sac still, which will soon be the placenta. Dennis got to be here for this ultrasound and it was so touching to look over and see him watching our childs heart beating. Another baby on the way, isn't that great? Let me be kind and give you a few clues. What will the baby's big sister think? Will we be painting the nursery blue or pink? If it's longer than that it sure will be a bummer. 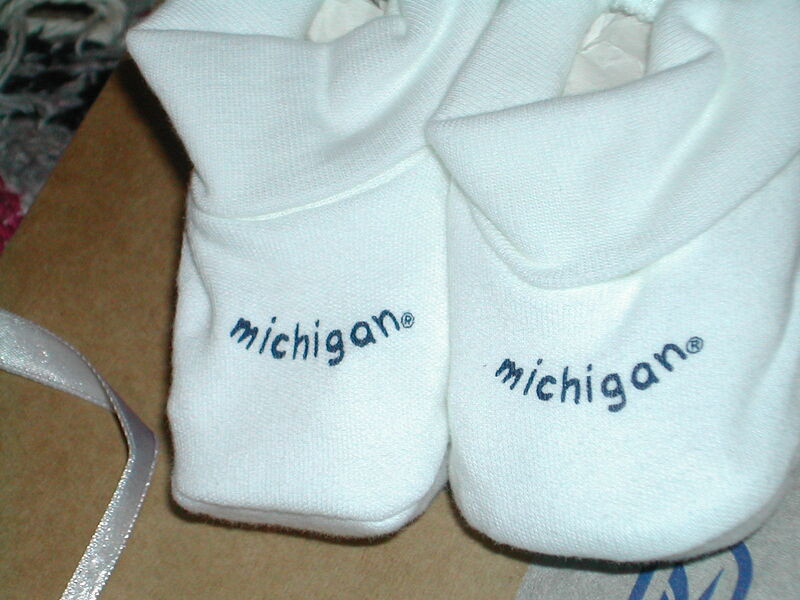 And if it's a boy, you know he'll be dressed in all Michigan! Do you have a guess yet, who mommy and daddy might be? With one more addition to our proud family! So, the big event came and no one noticed that on the cover of the album it said "Great Grandchild #8", they flipped throught the album, just thinking it was regular photo album.........as soon as they came to the ultrsound picture people started guessing. They guessed Heidi first, then I think about 3 people thought of me and screamed out my name. I was sitting in the back of the room, my heart just racing and when they looked back at me, I just shook my head yes, and they came running back to me and we all started crying. So LOTS of excitement this Christmas Eve............and the baby already got presents from Grandma and Grandpa Deden this year! Next came telling Dennis' parents and family on Christmas Day. Jim, Judy, Chad and Darin came to our house for Christmas Day. We ate dinner and then decided to open up presents. We decided to wrap up a couple of Grandma frames with the ultrasound pictures in them and letting Judy open those up and then telling them they were going to be grandparents. So finally, the last gifts to be opened were the gifts related to the baby. Judy opened her present and saw the frames and said, "Grandma? ", and Dennis said, "you're going to be a Grandma" The floodgates opened and we all started crying and hugging. Jim and Judy also got "I Love Grandma" and "I Love Grandpa" bibs for Christmas. Here are the proud grandparents! This will be the first grandchild on both sides of our family and I think this child is going to be a little spoiled! He/She will have lots of cousins to play with once he/she comes and lots of gorgeous hand-me-downs if it's a girl! The weekend after Christmas we got to tell our friends down in Iowa. We first stopped by Aaron and April's new house and saw their new baby. Check out his info on the New Arrivals webpage. We then went out and ran into a lot of Dennis' friends that night and he got to announce the news to everyone. The next people to find out where my Grandma Bredeson-Ryshavy, my dad, Lynn and my aunt Holli. My Gma is down in Arizona for the winter and my dad is living in Bakersfield, CA. I felt bad having to use email to announce the news, but it is the 21st century....:-)~ My aunt Holli is also expecting her first child in about 4 weeks.....another playmate for the baby! Well, next is New Year's Eve. I got to enjoy the night eating and hanging out with friends. The baby made the night enjoyable, as she did not bless me with the nausea that he/she has been doing the last couple of days. Oh yes, the nausea is starting. I didn't think I'd get away with some nausea......so the baby is continuing to make it's presence known. I don't have another doctor's appt until mid January. At the time I'll be meeting with a nurse and then choosing a Obstetrician. I have an idea of who I would like as I have lots of family members who have had the same OB. Dennis and I are cautiously waiting for the first trimester to end. 4 weeks away and right around my 28th birthday. If we can make it there safely, I think we'd both feel a bit at ease.........what a great gift that would be. So keep us and our little one in your thoughts and prayers. He/She has lots of people who already love him/her and needs to make it to us safely. Well, the first trimester is almost over! I can't believe it.........and everyone says the next 12 weeks will be the easiest. So far, the pregnancy hasn't been too bad, so far not too many complaints.. I'm just getting anxious to start showing! :-) I know, people say I'm crazy for wishing that, but that'll make things a bit more real. A lot of people have been asking, "are you going to find out what you're having? ".....and I emphaticially reply, "of course! "..........and for several reasons, I'm going to be pretty busy after the baby is born with wedding stuff..........and another big reason, I CAN'T WAIT TO GO SHOPPING!!!! and get started on the nursery. Another question I get a lot of is, "what are you going to do about your wedding dress? "..........well, I have now started looking for dresses........and I'm hoping to find 'the one' before I start showing. My goal was to have my dress found by the end of my first trimester, but that'll be soon, and I've got some more looking to do. Once I find that dress, I will be ordering at least 1 size, if not 2, bigger than I am now. You just never know.......I'm most worried about the top.....making sure that all fits. In other baby realted news, I had my initial appointment with an OB nurse and have my first appt made with my Obstetrician shortly after my 12th week. I decided to go with the same doctor several of my cousins and my aunt have had. I've heard great things about him. Dennis can start coming to the appointments now too, and it'll be exciting to hear the heartbeating now. I can't wait to have another ultrasound, just to see the big changes that have been made. In my "Your Pregnancy, week by week" book, they have pictures of the actual size and characterisiics of the baby, and I cannot believe the changes. Everything is pretty much developed, just very, very small. That's about all I have for news now. Will keep everyone updated as needed! Well, week 12 has finally come! It is such a relief to get over that first milestone and I'm now into what the call "the honeymoon phase". The morning sickness and fatigue is better for the next trimester, so I've been told, "enjoy it now, because it won't last that long!" I do have to say, I am starting to feel more like myself. It was getting me worried for a while because it was such a huge change from how I felt before. But, after my doctor's appointment in the middle of the week, I knew the baby was ok. I had my first official OB appt on Wednesday. I did not get to meet with my particular doctor as he was ill, but met with a Dr anyway. She did my exam and I was told that I was even going to have another ultrasound! I was so excited.......but opened my big mouth and said that I had already had one. They didn't find it necessary to do one at this stage as I've already had two done before. I was so excited to see how big the baby has gotten. The good news is, I did get to listen to the baby's heartbeating. It is SO amazing to hear that for the first time. That there is something living and growing inside of me. And that little person is a little mixture of me and Dennis! I get more and more excited all the time to see this baby! As soon as the Dr put the doppler onto my belly, I could hear the heartbeating instantly! She didn't have to go searching at all! The heart was beating about 160 bpm (beats per minute). It was so encouraging to hear the heart beat so easily. It's so hard when you cannot feel the baby yet, I just worry so much that everything is ok. I won't have to go back to the doctor for another month, the end of February. I'll be about 16 weeks then. It won't be until my 20 week visit, before I have my big ultrasound to check the baby from head to toe. And that includes, finally getting to hear if it's a boy or a girl!!!! That seems so far away! Some more good news, I finally found a wedding dress! Perfect timing too! I didn't want to start showing too much. The sad part is, I had to order the dress to my size.............and it won't be here until May. Well, by that time, I'll definitely be showing and probably won't be able to fit my dress over my belly! So, I won't even be able to try it on! :-( It's going to be so great though! I don't want to give too much away, but I think everyone is going to just love it! I'd like to thank all of friends and family already who have been sharing in our excitement! We couldn't ask for a better support system and better people in our world to introduce our child to. We love you all and don't know what we'd do without you! Click here for Trimester #2 page!!! !